We did things a little backwards in comparison to most organizations: we introduced the eLearning Academy first with our volunteers, since a donor who supports the volunteer program provided the funding. The volunteers use it for the learning modules, but also to communicate with one another. 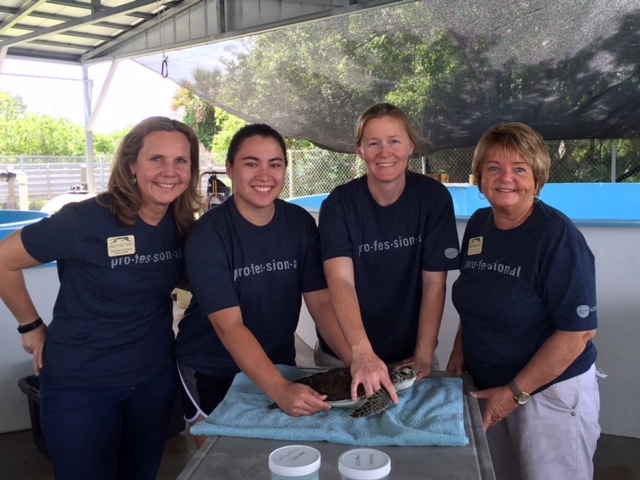 For example, the volunteers who are part of the Sea Turtle Healing Center Team communicate back and forth using "Discussions." Many things can change from one shift to another, so they use Discussions to give each other animal updates. Likewise, our Greenhouse Team uses Discussions to let other shifts know what they have done, such as watering, planting, and fertilizing, and they can leave updates on what seeds the commissary would like to have planted. The staff that supervises these volunteers has also been registered on the appropriate team, so they can communicate with their volunteers and read the updates posted. This also allows them a great platform for uploading resources they want the volunteers to read. HR is now actively encouraging staff to register and utilize the many available modules. Several of the compliance modules have been made a mandatory part of the onboarding and orientation process, while other modules are deemed mandatory by individual departments. The number of additional job-related modules taken by an individual is tracked and used when determining the amount of that individual's annual bonus. The "DIY" feature is used to create our own Brevard Zoo-specific modules, also used as part of the orientation and training process to save dollars (staff time) and improve efficiencies. It also guarantees every new staff member or volunteer is receiving the same information. We are still experimenting with the DIY feature, but we will be greatly increasing our utilization in 2016. We continue to discover new ways to use the "Teams" feature, again both for staff and volunteers. The "Events" page is a particularly effective tool for our Conservation Team, for posting and seeking volunteer help in its many offsite programs. As part of their strategies and goals for 2016, the HR director and the volunteer director jointly have several goals that are directly related to the Academy: for example, to, ensure high-quality training through a blended learning approach and to increase volunteer/staff retention. For those who want to learn more, the Academy certainly enhances staff/volunteer retention. We feel the Academy is an important component of blended learning, and we strive to use it to the fullest capacity to attain our goals for this year and going forward. We've come a long way from merely trying to get the volunteers to register on the Academy; now, both volunteers and staff are actively participating. Training staff and management are using it as a benchmark component for individual financial reward and advancement within the organization. We're looking forward to using eLearning with ever-enhanced expansion of our blended learning and communication methodologies. We find that eLearning is strongly utilized and appreciated by those who are looking for a long-term career within the organization. It's one more perk to offer those staff and volunteers who are committed to the organization and have embraced our mission: Wildlife Conservation through Education and Participation. 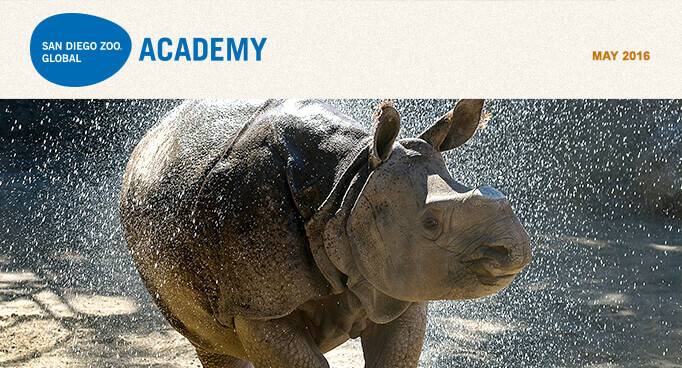 The Honolulu Zoo is now part of the Academy's collaborative learning environment. Welcome! Sneak Peak at New Book on San Diego Zoo Global! 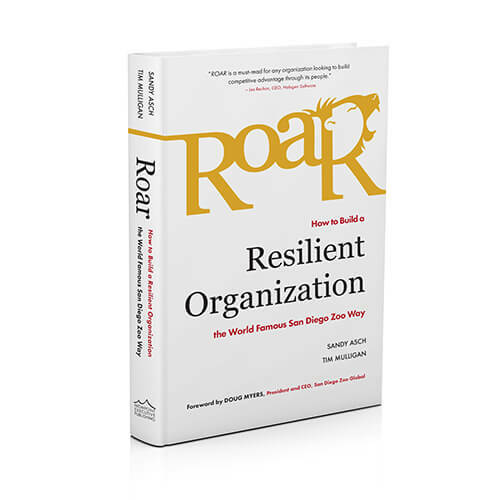 Learn how to unleash the full potential of your teams to create lasting organizational resiliency in Roar: How to Build a Resilient Organization the World Famous San Diego Zoo Way, by Sandy Asch and Tim Mulligan. Watch for upcoming news regarding this new book, including a related webinar that is coming soon. Click here to learn more! Please join us for the Administrator's Users Group Webinar hosted by Academy partner, CypherWorx. The next webinar is Wednesday, May 18 at 11:00 a.m. PDT. Click here to register. After registering, you will receive a confirmation email containing information about joining the webinar. When a new zoological exhibit is being planned, animal care staff should expect to play an important role on the architectural design team. This course is designed to enhance your understanding of the complicated modern zoological exhibit design and construction process. 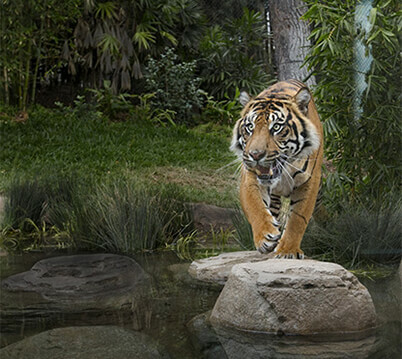 Using real-life examples, the course features the steps actually used for the planning, design, and construction of the award-winning Tull Family Tiger Trail exhibit at the San Diego Zoo Safari Park. To view a sample of Exhibit Design click here. Interpreters, guides, docents, and keepers can explore the fascinating world of mammals as San Diego Zoo Global Academy presents Mammals, the newest module in the Introducing Animals series about animal species and other taxonomic groups. The module explores the natural history and conservation of mammals. Remarkable images show a wide variety of mammal species in ways you've never seen before, and video provides insights into their behavior. Interactivity sprinkled throughout the module engages participants in the learning process, and questions at the end of each section ensure that they have mastered fundamental concepts before they move on. The Mammals module takes about two hours to complete, although participants progress at their own pace and may repeat the entire course or sections of the course as many times as they like. The module can easily be integrated into your current training program. Providing online modules that team members can complete anywhere and at any time overcomes one of the major challenges of training: getting all participants together in one place at one time. Participants are able to master key vocabulary and concepts, giving them a solid foundation that allows them—and their trainers—to make the most of in-class and on-site training. These modules are a great resource for interpreters, but they offer insights for veteran animal keepers too, providing a glimpse of natural history to help address husbandry concerns. This module addresses common questions and provides an up-close exploration of what mammals are all about. 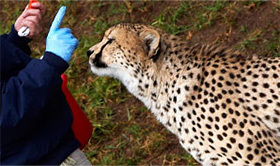 Whether you've worked with these animals for years or you're a brand-new interpreter or docent, the module will equip you with a better understanding of these amazing animals. The Mammals module joins Birds, Rhinoceroses, Elephants, Cats, Orangutans, Great Apes, Lions, Cheetahs, Polar Bears, Giant Pandas, Tigers, and Gorillas in the Introducing Animals series. Look for modules about giraffes, Old World monkeys, and penguins, coming soon. To view a sample of Mammals click here. This course will teach participants about compressed gases, both scientifically and in practical use. Participants will learn about regulations, uses, types, important terminology, various hazards, safe handling and storage, inspection, detection, emergency response methods, and containment. For more information on courses, please contact Julie Bittner at JBittner@Cypherworx.com. My journey in Animal Law, primarily within the marine mammal and zoological communities, has been inspired by animals and, of course, by people—sometimes by people holding very different perspectives. Hence, the powerful quote from a fellow Long Islander, Walt Whitman, which sets the stage for Chapter 11 in Excellence Beyond Compliance: "Enhancing Animal Welfare Through the Constructive Use of the Animal Welfare Act." "Have you learned lessons only of those who admired you, and were tender with you, and stood aside for you? Have you not learned great lessons from those who braced themselves against you, and disputed the passage with you?" There are countless different perspectives on recent, seemingly dramatic developments involving the marine mammal/zoological communities. In a world of animal matters marked by conflict, conversation and collaboration on matters of mutual concern are most welcome. As a general rule, constructive conversations and collaborations on behalf of animals are good things, no matter what differences in opinion or interpretation are brought to the table (and however imperfect the change or progress).To make the most of ongoing developments, we must take responsibility for doing greater good for the animals in our care and other people through the following actions. Making animal welfare an explicit overriding priority. The primary focus should be on the well-being of the animals in our care. Caring for live animals requires that their welfare be the overriding priority. Collaborating within our own groups, organizations, profession, and the zoological world; and with the full range of animal-related stakeholder interests. Elevating the way we engage each other. Elevating consciousness about animals is, as Pope Francis addressed in his Encyclical on the Environment, inextricably linked to our treatment of each other: "A sense of deep communion with the rest of nature cannot be real if our hearts lack tenderness, compassion and concern for our fellow human beings. …Everything is connected. Concern for the environment thus needs to be joined to a sincere love for our fellow human beings and an unwavering commitment to resolving the problems of society." With a "One Heart" philosophy in mind, the simple premise put forward in many recent talks about Excellence Beyond Compliance® has been: "Getting more people to treat more animals with greater compassion, dignity, and respect is more likely when we treat each other with greater compassion, dignity, and respect." Engaging each other and animal-related challenges constructively changes everything, and does so humanely and sustainably. Join us to learn more about the Animal Welfare Act and animal welfare, when the Ask Animal Care series continues on Thursday, May 19, 2016, at 3 p.m. EDT, with special guests USDA APHIS Animal Care Regional Directors Elizabeth Goldentyer, DVM, and Robert M. Gibbens, DVM; Associate Deputy Administrator Dr. Andrea Morgan; and new Deputy Administrator Bernadette Juarez. Register now to participate and get further details: info@excellencebeyondcompliance.com. ©2016 James F. Gesualdi, P.C. The opinions expressed herein are solely those of the author. This is not, nor should it be construed as, legal advice. For more information on Excellence Beyond Compliance® , visit info@excellencebeyondcompliance.com. The H3O+ is in fact the hydronium ion, but in general discussion, it is reduced to H+, the hydrogen ion. Generally, a low pH is acidic (high numbers of hydrogen ions H+) and a high pH is alkaline or basic (high numbers of hydroxyl ions OH-). The scale runs from 1 to 14, with 7 considered neutral pH. At a pH of 7, there are equal levels of hydrogen and hydroxyl ions. It is a negative logarithmic scale, which means that as the pH number goes lower, there is an increase in the number of hydrogen ions (H+). Thus, a pH of 7 has 10 times more H+ than a pH of 8. Subsequently, a pH of 6 has 100 times more H+ than a pH of 8. The pH level in water probably has more effects than any other factor. The pH has one of the most profound effects on the toxicity of ammonia in the water. As the pH increases (more alkaline) the percentage of the toxic ammonia component increases. This was discussed in detail in the webinar on the nitrogen cycle. The pH of water is directly related to the level of hardness and alkalinity present in the water. Fresh water can show an enormous range of variation, which is largely dependent on the local soil type. High pH (alkaline) levels will occur in lakes and streams that are surrounded by high carbonate-containing geography. This mainly relates to limestone (calcium carbonate CaCO3) and dolomite (calcium magnesium carbonate CaMg(CO3)2) regions. It is possible to have pH values up to 9.0 in these areas. The carbonate also provides significant buffering capacity. Low pH occurs in lakes and streams associated with acid-sulphate soils (also called cat’s clay). Another factor that can lower the pH is the presence of decaying vegetation in the water, which produces organic acids (humic acids). This occurs in the Amazon basin. The pH of seawater is usually 8.1 to 8.3. The pH of seawater is very constant, due to the enormous buffering capability of the bicarbonate and borate systems. As a consequence, marine fish are more sensitive to pH changes than freshwater fish. Marine fish are only comfortable in the pH range of 7.5 to 8.5. Next month, we will look at some other water quality parameters. The San Diego Zoo Global Academy is excited to share an additional Academy subscriber benefit regarding our collaboration with Dr. Jones: as an Academy subscriber, you are entitled to a discount on the e-quarist™ courses. 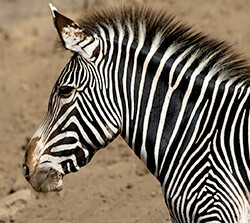 As an added Academy benefit, you can view the latest San Diego Zoo Global Zoo and Conservation News here.